Information system managers are the important part of an organization who has a job to maintain and supervise the computer and networking system. The common job tasks that are assigned to an information system manager are purchasing equipment, implementing the policies of the company, researching new system, maintaining the up gradation of the existing systems etc. An information system manager is a skilled person who is demanded by almost every organization. When you, as an information system manager gets another job opportunity you are required to resign from your current job. For this, you have to write a resignation letter. No matter what are the reasons behind your decision of quitting the job, you may always want to write a resignation letter with the polite and appropriate tone. Before you write this resignation letter, you should know about the details that should be included in it and the details that should be avoided. For this, there are some templates for the resignation letter that you can use but make sure that you tailor the resignation letter to make it fit your individual conditions. You may want to write a resignation letter including the reason for leaving the job especially when you want to share good news about your career. Your employer may not find your decision of leaving the job to be positive, sharing the good news will put a positive impression on him that you want to pursue a successful career. 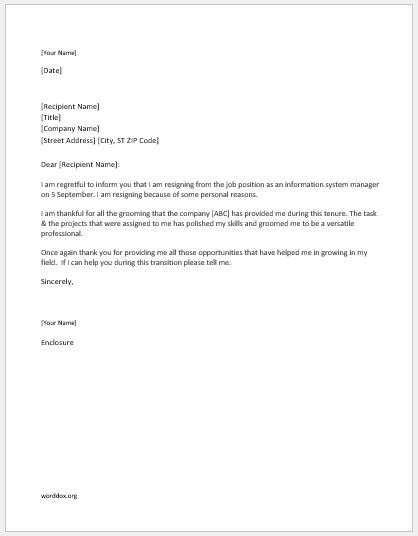 Here is a sample resignation letter that you can use while resigning from the position of information system manager. I am regretful to inform you that I am resigning from the job position as an information system manager on 5 September. I am resigning because of some personal reasons. I am thankful for all the grooming that the company [ABC] has provided me during the tenure. The task & the projects that were assigned to me has polished my skills and groomed me to be a versatile professional. Once again thank you for providing me all those opportunities that have helped me in growing in my field. If I can help you during this transition please tell me.